The Fol-Da-Tank Aluminum Low Flow Low Level Strainer - 5quot; NH Threads is professionaly designed & engineered for maximum pumping capacity. 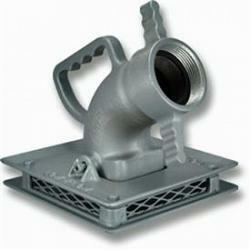 Al-Mag castings - proven to be the toughest in the industry! The Low-Flow Low-Level will perform at maximum pumping capacity down to a water level of 1.5" - 2" depending on your set up area. Flow Rate - Tested with 6" Low-Flow Low-Level rate is 1700 - 2000 GPM. The flow rates may vary due to the design of the pumper and the set up area of your pumper and Fol-Da-Tank. Use of a male and female SST flange mounted on the side wall of your Fol-Da-Tank will eliminate the lifting factor when pumping from the side of the tank. Comes standard with a 1.5" Water Transfer Device - available on sizes 4" to 6"
We warranty FOL-DA-TANK Co. products to meet generally recognized standards of quality and excellence in the trade for goods of their type and kind. Should the heat sealed seams on a portable tank liner or the welds on a frame become defective FOL-DA-TANK Co. offers a LIFETIME WARRANTY replacement upon the return for inspection. Fol-Da-Tank liners and self supporting tanks purchased prior to 2006 we will repair at no charge, however the customer will be responsible for freight charges each way. A 3 year warranty applies to all strainers and accessories. We reserve the right of requiring the return of defective parts or tanks, transportation and insurance be prepaid, before a claim is recognized. Upon customers proof of delivery our warranty will be in effect. Misuse or abuse will automatically void this warranty. From 2011 to present look for your warranty stencil on all Fol-Da-Tank liners and self supporting tanks for proof of purchase.